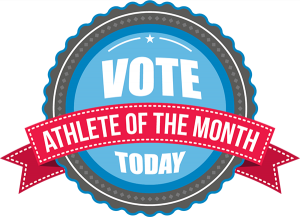 DAPHNE, Ala. – The United States Sports Academy has announced its Athlete of the Month ballot for February and public voting is in progress. Following the selection committee’s meeting, 12 candidates – six male and six female – from eight countries comprise the list. Everyone is encouraged to cast a vote on the Academy’s website at www.ussa.edu and have friends do the same. The full ballot is listed along with bios of what each athlete accomplished during the month. Voting will continue until 5 p.m. Central time on Thursday, 9 March 2017. Male nominees are Tom Brady, football, United States; Edward Cheserek, track and field, Kenya; Marcel Hirscher, skiing, Austria; Sven Kramer, speed skating, Netherlands; Hideki Matsuyama, golf, Japan; and Deontay Wilder, boxing, United States. Female nominees are Genzebe Dibaba, running, Ethiopia; Katie Ledecky, swimming, United States; Keturah Orji, track and field, United States; Kelsey Plum, basketball, United States; Lena Schoneborn, pentathlon, Germany; and Maryna Zuyeva, speed skating, Belarus. The awards honor exemplary achievement in coaching, all-around athletic performance, courage, humanitarian activity, fitness, and media, among others. The Academy’s American Sport Art Museum and Archives (ASAMA) annually recognizes these men and women through its Sport Artist of the Year, Honorary Doctorates, Distinguished Service Awards, Medallion Series, Outstanding Athletes, and Alumni of the Year awards. This is the 33rd year of the Academy’s Awards of Sport program.